All Specialty Turned Designs gift products are turned by Michael Hughes using a lathe in his workshop. While Michael can turn materials up to three feet in length, most of the gifts he creates are smaller. Without question, Michael's most popular gifts are executive quality pens. Also popular are mechanical pencils well as matching pen and pencil sets. These are absolutely top-of-the-line writing instruments. After you've used one of Michael's pens, you will never want to go back to using a BIC pen. These pens are made using the same components that Montblanc uses in their pens. All these pens use either Parker or Cross refills, so pen refills are available anywhere. But if you bring your pen back to Michael, he will provide you with a free pen refill. He will also polish your pen and make it look brand new again. In addition to the material used to make the pen, there are a variety of different pen designs to choose from. There are twist pens, click pens and pens with removable covers. The pen hardware is available in several different materials, including chrome and brass. 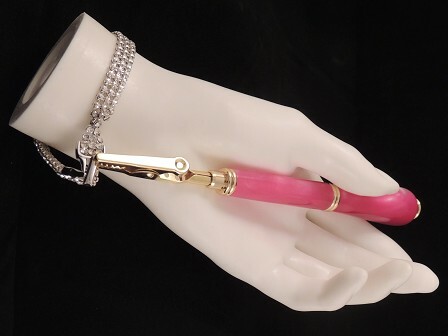 There are also novelty pen designs, such as a pen that resembles a rifle. 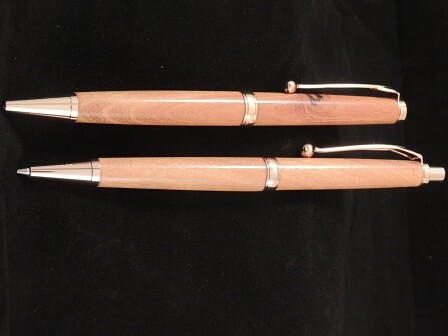 Make sure you visit our Picture Gallery to see several of Michael's pen designs. Michael also makes bottle stoppers for wine bottles. This is a very popular gift. 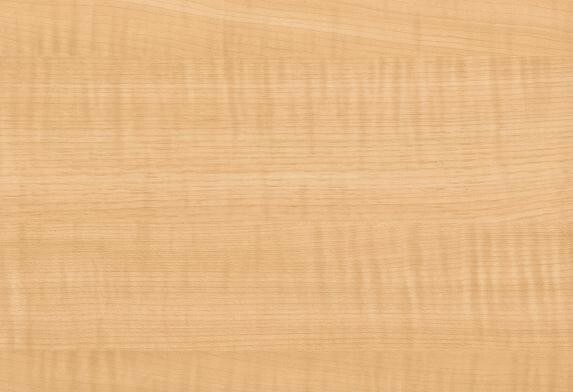 It takes four pieces of material glued together, sometimes using materials of different bold colors that really look strikingly beautiful together. 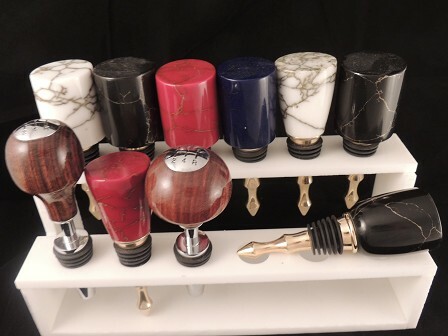 One popular gift idea is to take a small jewelry item such as a sorority pin or a company stick pin or an American flag tie pin and cast this jewelry into a solid piece of acrylic which can then be turned into an extremely unique bottle stopper. The only limit is your imagination when it comes to creating beautiful, very specialized bottle stopper gifts. A very popular gift for women is Michael's Bracelet Assistant. Many people will look at Michael's Bracelet Assistant and think that's it's a roach clip. From his perspective, what you do with it after you get your bracelet on is strictly up to you. It is very handy for putting on a bracelet by yourself. You attach the Bracelet Assistant to one end of your bracelet, and you wrap the other end of the bracelet around your wrist. 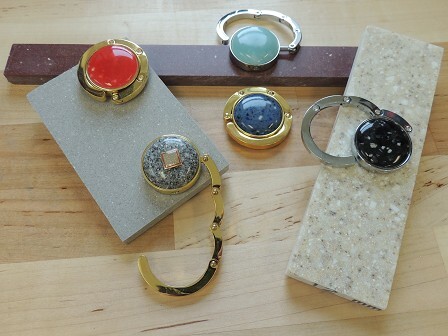 Then, you can attach the bracelet's clasp and disconnect the Bracelet Assistant. It's like having a third hand, and it makes a perfect gift for the woman who needs something like this in her jewelry box. Michael has received enough feedback about the Bracelet Assistant that he's thinking about setting up a booth and selling them at this year's Comfest! 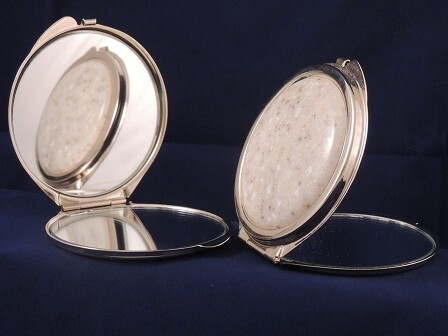 Also for ladies, Michael creates Pill Boxes, Purse Compacts with mirrors, and Purse Hangers. A woman can use a Purse Hanger to securely hang her purse underneath the table while she is out dining in a restaurant. 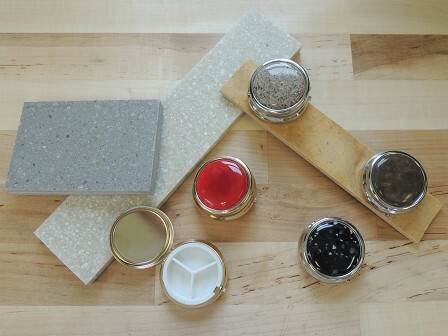 It's very popular for Michael to make a matching three-piece gift set with a Pill Box, a Purse Compact and a Purse Hanger, all made from the same material. This makes a really unique gift for a lady that is very affordable and very glamorous.